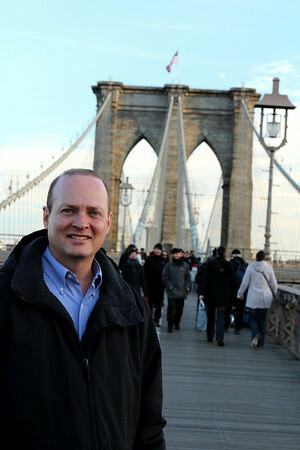 Our fourth morning in New York began with a brisk walk toward Rockefeller Center, during which I annoyed Scott by stopping to take a few photos. As if this was something new. 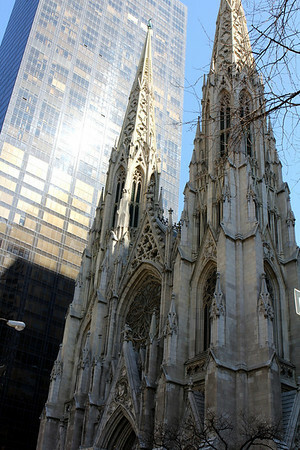 We never made it inside St. Patrick's Cathedral, but it sure was marvelous to look at. And of course my photo doesn't come close to doing it justice since I was a little too close to fit it all in, but if I had taken any longer it might have pushed Scott over the ledge. 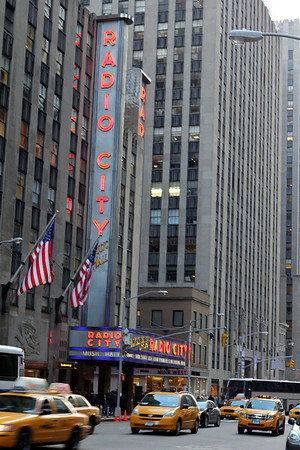 Once we arrived at the NBC building, Scott finally exhaled and we took our places in line for the studio tour. We couldn't take photos during the tour (seriously? c'mon NBC!) 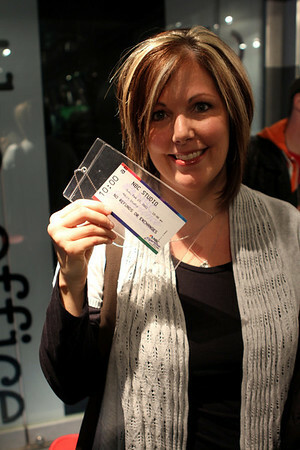 so I only have that one of me holding my ticket like a geek under the super flattering overhead lights as a memento. Of course, they conveniently sell a cheesy overpriced photo of you in front of a fake news desk at the end of the tour (I'd really like to know who coughs up the dough for those). Of all the things we did during our trip this tour was my least favorite, but it ended up only costing 1.5 hours of my life and the price of our tickets, so whatevs. They (the NBC pages, and no, not Kenneth) tell you a few interesting tidbits about the production process, a bit about NBC history and show you a few studios (Dr. Oz, Late Night with Jimmy Fallon and Saturday Night Live) all of which earned a shoulder shrug and an "Eh" from me, but Scott enjoyed it so that's good. After the tour Scott went down to Times Square to try and get discount tickets for a show that night, which turned out to be a bust, and I went to the American Girl store. I had never been inside one before and must admit I was a tad overwhelmed with all the choices of clothes, dolls, accessories and such (I didn't see the *salon* but heard about it). Scott found me a little while later with a fairly full shopping bag and glazed over eyes. 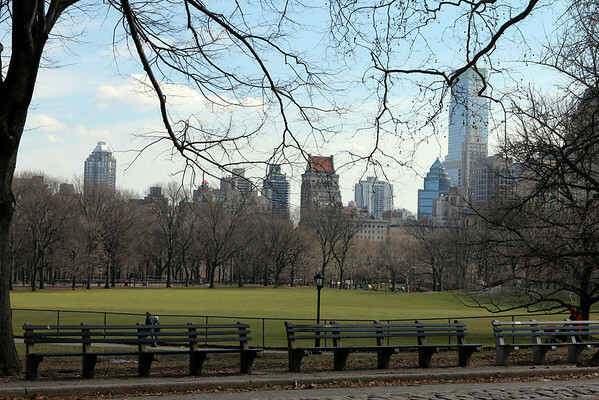 After all of that commercialism what better way to decompress than spending a lovely Sunday afternoon in Central Park? So of course that's what we did, stopping first at the memorial to John Lennon which was rather populated with tourists and one lone musician belting out Beatles tunes. 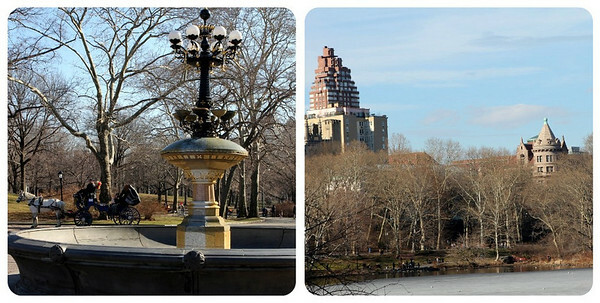 The building in the bottom right photo is the Dakota, which is where he and Yoko lived (she still does). 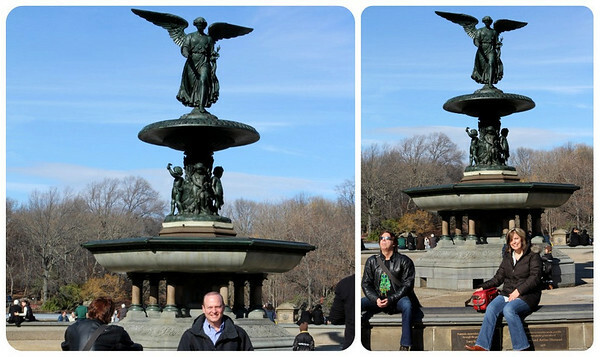 Scott and I then headed in the direction (we hoped) of the Bethesda Fountain yet not fully aware of how, um...enormous Central Park actually is. It was then we met Keete, a pedicab driver, who after a brief negotiation became our pedaling tour guide for the next hour. 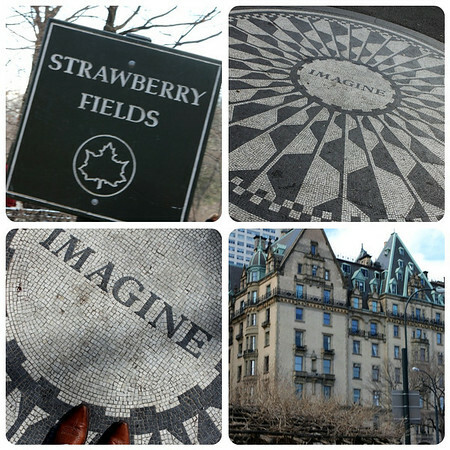 This turned out to be one of our more brilliant, spontaneous ideas and we both enjoyed our tour through Central Park taking in all the gorgeous views and popular landmarks. It was incredibly refreshing to see so much nature surrounded by so much steel and glass of The City. It's the perfect haven, an oasis, from the busyness outside its gates. 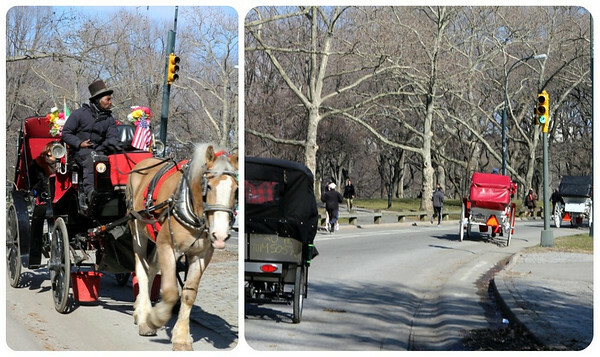 As we rode along we kept seeing the horse drawn carriages but never saw their drivers interacting with their passengers (one was even reading the newspaper! ), but our Keete kept us informed and shared lots of points of interest with us. We also saw tons of runners taking advantage of the beautiful brisk afternoon which made me itch to start running again (but not just then, of course). We walked up this enormous rock (cliff?) to see the ice skaters. Could you imagine skating there regularly? Or even just once? What a treat! 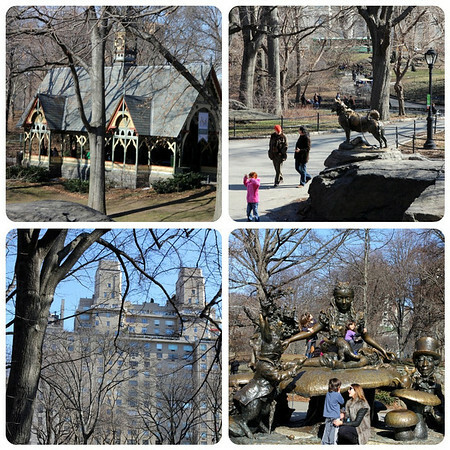 We saw the dairy, Balto, Alice in Wonderland and Jackie O's building on Fifth Ave. Oh the life! 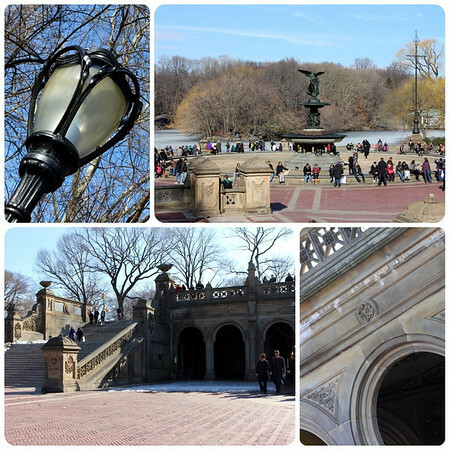 Next up was the Bethesda Fountain (where the great scene from Enchanted was filmed). We didn't get a picture together (I won't hand over my big-McDaddy camera to just anyone and the fountain was crawling with people so we took turns and saved our spots). The man next to me was certainly chillaxin' (duuude) wasn't he? As our tour was drawing (pedaling?) to a close we saw another fountain, this one of Friends' fame, and some other important buildings in the distance that I can no longer remember. Maybe one is the Museum of Natural History? Maybe Michael Douglas and Catherine Zeta Jones live in one? Keete dropped us off right where we started at Strawberry Fields and we retreated to a lovely bench to plan the rest of our afternoon. Look! 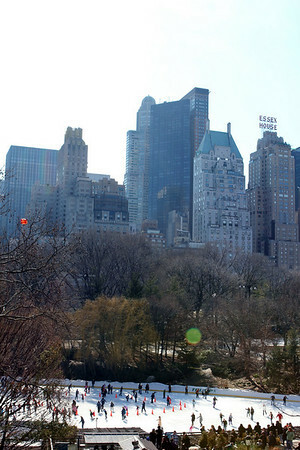 A photo of us together in Central Park! I asked a lady passing by to take our picture with my point and shoot and she graciously obliged (unfortunately I had it set on high ISO so it's a bit blown out, but still...). 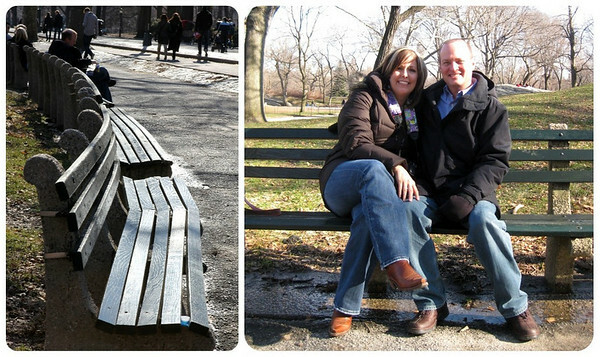 As we perched on our bench and people watched (I could have spent all day doing that!) I suddenly felt the need for a cupcake and announced we should go to Magnolia Bakery. Thankfully our Around Me app told us there was one nearby, along with a needed Metro stop, so we set off to satisfy our (my) sweet tooth. double chocolate for Scott and red velvet for me. My feeble words can not do them justice. I'm still thinking about that frosting a week later. 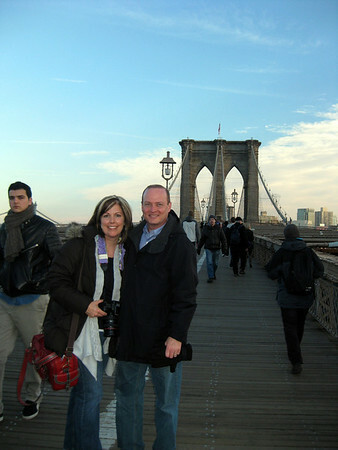 Next up on our agenda was a subway ride downtown to the Brooklyn Bridge. Once we had walked almost halfway we plopped ourselves down right there on the backside of one of the arches to decide if we'd continue all the way across or turn back. How could we wimp out and turn back and hold our heads high back home? 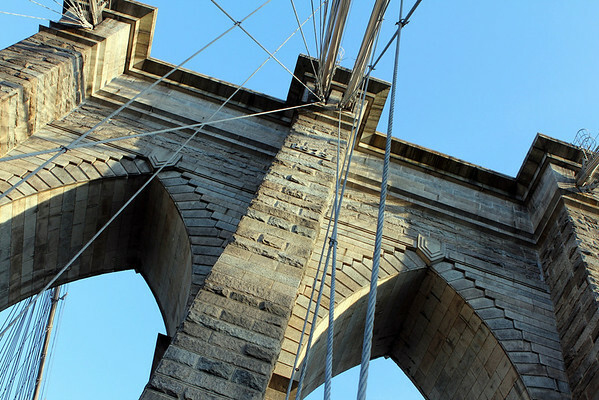 When would we ever get another opportunity to say we walked the Brooklyn Bridge? 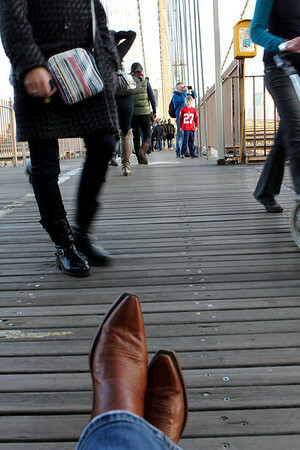 We decided to go for it and keep our feet headed toward Brooklyn. I'm sooooo glad we did! Once we got into Brooklyn this was our reward (thanks to the directions of two helpful locals). We totally forgot about our 45 minute wait in line outside once this beautiful, and delicious pie arrived at our table. My friends, that is some pizza! It was the perfect end to another perfect New York day. Hmm...I wonder if Grimaldi's delivers? 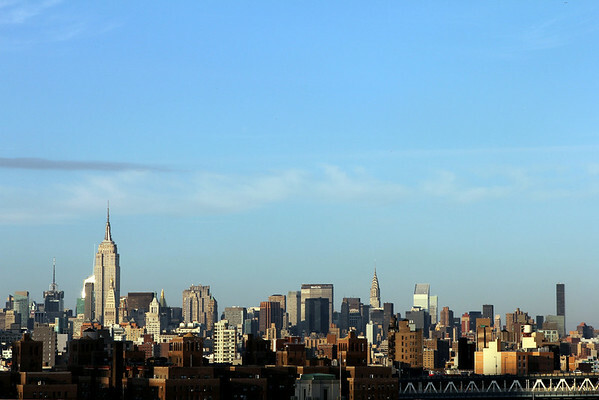 One more NYC recap to go my friends...stay tuned! What a wonderful trip and fantastic photos! Scott is such a good sport with the picture taking. 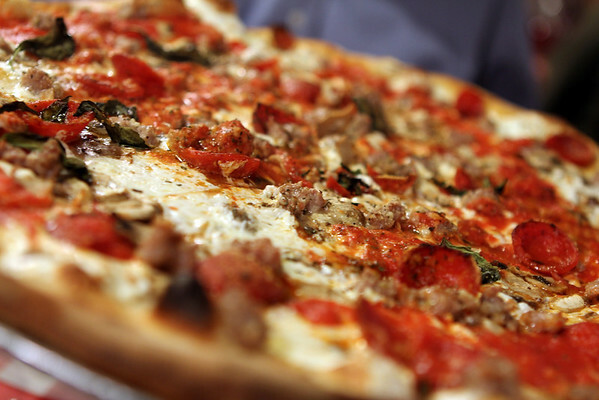 I have heard of Grimaldi's pizza - so glad you were able to try it. I was hoping the photo was 4d, I really wanted to reach in and grab a pepperoni! We have an American Girl store here in Atlanta. My sister sent me in there for my niece before Christmas. Talk about sensory overload. A maze of outfits, dolls and accessories. Little girl heaven. I cannot believe what a great trip this is!? You guys seriously did NY right!! I am impressed by so much of this trip & now I NEED to go back... IT's a NEEd people! You really liked the cupcakes at Magnolia Bakery? Because, I had one several years back & it was gross... like stick to the roof of your mouth, cheap, grocery store frosting & dry. Maybe it was just a bad batch? Brilliant idea taking the pedi cab! I am going to do that someday!! 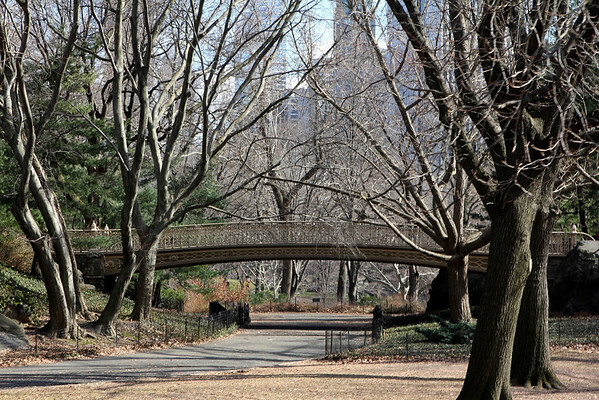 We never see enough of Central park- it's just SO huge- why didn't we think of that. American Girl- I know it's outrageous... but you just can't help but love that place. I'm dying to know what you bought. 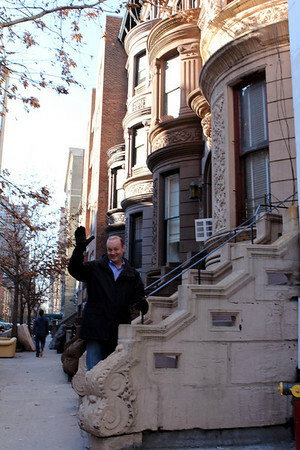 Gee- I wish we were neighbors so we could meet at starbucks or something!! I am enjoying this trip vicariously through you. I haven't been since grad school and I am itching to go back just me and Kim. It doesn't help that a good friend of mine lives in Brooklyn and while she came to see us for New Year'S AND again last weekend, we have never been to see her in NY. One of my employees has 3 daughters and she has taken each one to NY with just her on their 13th b'day. I would love to do that with my kids but don't know if that will be a reality. Question: How did you handle all of this meat and treats on the vacation, after being almost vegetarian? I fear it would make me sick but you look great! I am loving these posts about your trip! Great photos and such fun memories with just the two of you. 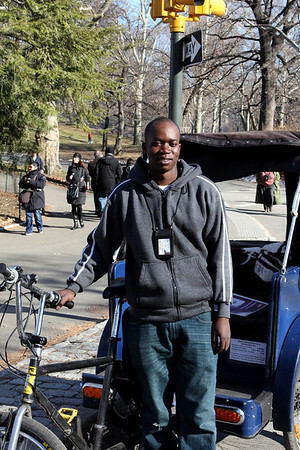 The pedicab ride through Central Park sounds great. Those spontaneous decisions sometimes prove to be the best ones! Patsy: We both really liked our Magnolia Bakery cupcakes--they were moist and the frosting was light and creamy--and tasty. Maybe each location is different? Or maybe the ones we had were more fresh? Sorry y'all's weren't so good--that stinks! Natasha: Our first day I ate a spinach salad for lunch and Scott bought some fruit at a deli for me to keep in the hotel but it was HARD making good choices when your eating schedule is off and you get desperate but I tried to not go too wild. Plus we walked a LOT so I never felt too guilty. :) I was ready though to get back on track though as soon as we got home--spinach smoothie first thing! Thankfully though I never felt sick or had digestive issues on our trip. 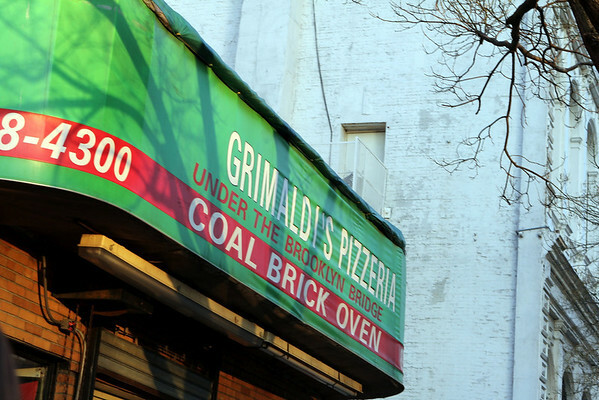 I'm still thinking about Grimaldi's pizza! YUM!